Chinese shrimp balls make a delicious appetizer. 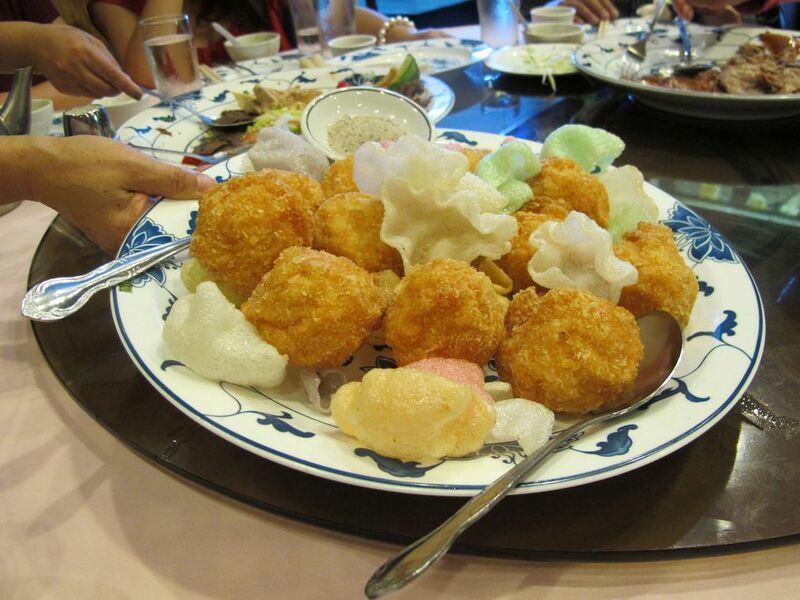 The shrimp balls are nicely seasoned and have water chestnuts added for some crunch. They are sure to please your guests, whether set out on an appetizer buffet or passed. You can choose the dipping sauce to accompany them. Some people like sweet and sour sauce, cocktail sauce, or spicy Chinese mustard sauce. An advantage of this recipe is that it can be prepared gluten-free as long as you use gluten-free soy sauce and gluten-free cornstarch. If you like breading or a crunchier coating, variations are provided. However, they would not usually be gluten-free. Heat the oil for deep-frying to 350 F.
Soak the shrimp in warm, lightly salted water for 5 minutes. Rinse in cold water, drain, and pat dry with paper towels. If using canned water chestnuts, run them under warm water to remove any tinny taste. Drain. Mince the shrimp and water chestnuts. In a medium bowl, combine the minced shrimp and water chestnuts. Mix in the chopped green onion, grated ginger, soy sauce, rice wine, sugar, sesame oil, pepper, egg white, and cornstarch. Form the mixture into small balls, approximately 1 inch in diameter (about half the size of a golf ball). Carefully add the shrimp balls to the hot oil, adding only a few at a time so as not to overcrowd the wok. Deep-fry the balls, turning constantly, until they are crisp and golden (3 to 4 minutes). Remove the shrimp balls from the hot oil and drain them on paper towels. Serve the shrimp balls with sweet and sour sauce, plum sauce, or hot mustard. For ease of dipping, you can skewer each on a cocktail toothpick. This works for both passed appetizers and those presented on a tray buffet-style for self-service. If you are preparing a large batch or making them ahead, reheat them in the oven on a rack set for about 2 minutes at 375 F.
Refrigerate any leftovers. You can reheat them in the microwave or in the oven, although they won't have the same deep-fried texture. This recipe keeps it simple in using cornstarch as the coating. If you want more texture, you could roll the shrimp balls in a plate of panko breadcrumbs before deep-frying. Or, cut wonton skins into small strips and roll the shrimp balls in them before deep-frying.